According to a report from the Associated Press, Nebraska law enforcement investigators are looking into death threats leveled against John Higgins, the referee whose personal life and career as the owner of an Omaha roofing company have now been the focus of pissbaby Kentucky fans for over a week-and-a-half. 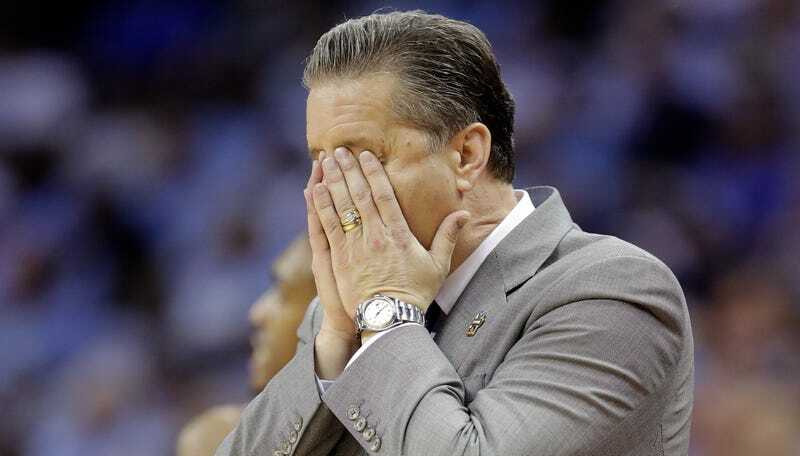 For those catching up, Higgins officiated the Wildcats’ two-point Elite Eight loss to eventual national champions North Carolina; during and after the game, Higgins was personally blamed by the Kentucky radio crew, and the officiating crew in general was called out by head coach John Calipari. Fans then flooded Higgins’s roofing business’s Facebook page and phone lines with negative reviews, threats, and complaints; they also filed false complaints to the Better Business Bureau. Sarpy County Sheriff’s detective Matt Barrall told the AP on Wednesday that he was on his fifth day investigating the threats made against Higgins; so far, he said he’s turned up between 200 and 300 emails and social media posts and 450 phone calls and voicemails—he said roughly 3,000 calls, 75 percent from Kentucky area codes, were made to Higgins’s office just 48 hours after the game. According to a Tuesday report from the Omaha World-Hearld, Higgins has since blocked all Kentucky area code phone numbers, which he says has helped since his phone number, home address, and business address were all circulated on social media. Some of the communications fall under terroristic threats, which would potentially lead to offending fans being charged with a felony, but Barrell told the AP he wouldn’t discuss how many cases fell under that category until he finished reviewing all the messages. For the time being, Higgins’s local sheriff’s department has bumped up the number of patrol cars around his business office; the same measure is being taken by Omaha police around Higgins’s home.